Urban poverty is a serious global problem. There are 1 billion people living in slums all over the world. In the Philippines, this problem is paramount and urgent. 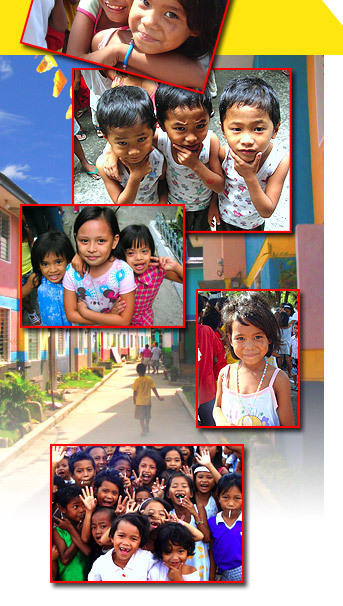 We can all do our bit and make the Philippines and the world an even more beautiful place to live in by helping eradicate the slums of our cities and rehousing poor deprived families in cleaner, safer, self-reliant and happier communities. The Philippines is an archipelago of 7,107 tropical islands, many of them untouched, a geographical phenomenon intricately positioned in the western Pacific ocean in Southeast Asia. It is a land of many contrasts.....Paradise-like verdant fertile islands, endless miles of stunning white beaches, clear turquoise seas endowed with the world's richest marine and coral life, dazzling hills and mountains, stretches of dense virgin rainforests as well as treacherous volcanoes and periodic typhoons ravaging homes and agricultural life. A young thriving republic gaining independence in 1898 after nearly 400 years of Spanish colonialisation, the Republic of the Philippines, attracting foreign elements mainly because of its ideal geographical position and wealth in natural resources, further endured many years of colonial rule and subjugation, disrupting the smooth continuity of governance and of growth and life in general.. This, coupled with a fragmented geography resulting in a clannish or regional mentality, led the country to struggle even more in attaining national unity and social-economic progress. It is also a land of extreme wealth and extreme poverty. With a current population of over 80 million, the Philippines' problems have been exacerbated by the lure of people to the cities where a "slum" culture is quickly established, people finding themselves entrenched in a vicious poverty trap of no decent homes, no employment, inadequate education, no choice or movement in the social scale. It is indeed ironic that this blessed land of natural bounty and beauty, of smiles and laughter, and of warm, generous, hospitable, hardworking and enduring people, should be unjustly besieged by poverty beyond belief. 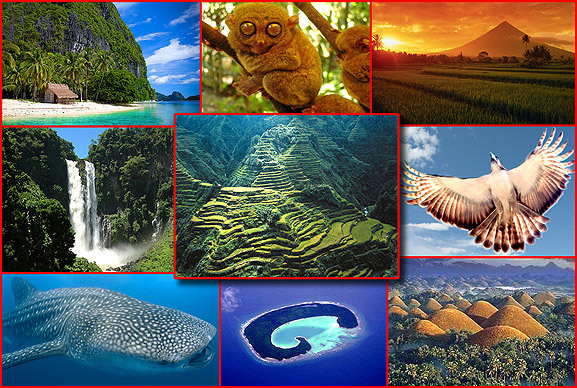 Above: The many wonders of the Philippines... Palawan, the Philippine tarsier (world's smallest primate), Mayon Volcano, Maria Cristina Falls, ancient Rice Terraces of the Philippine Cordilleras (starting 6,000 years ago), the Philippine Eagle (world's largest eagle), whale shark, Turtle Island, Chocolate Hills of Bohol.